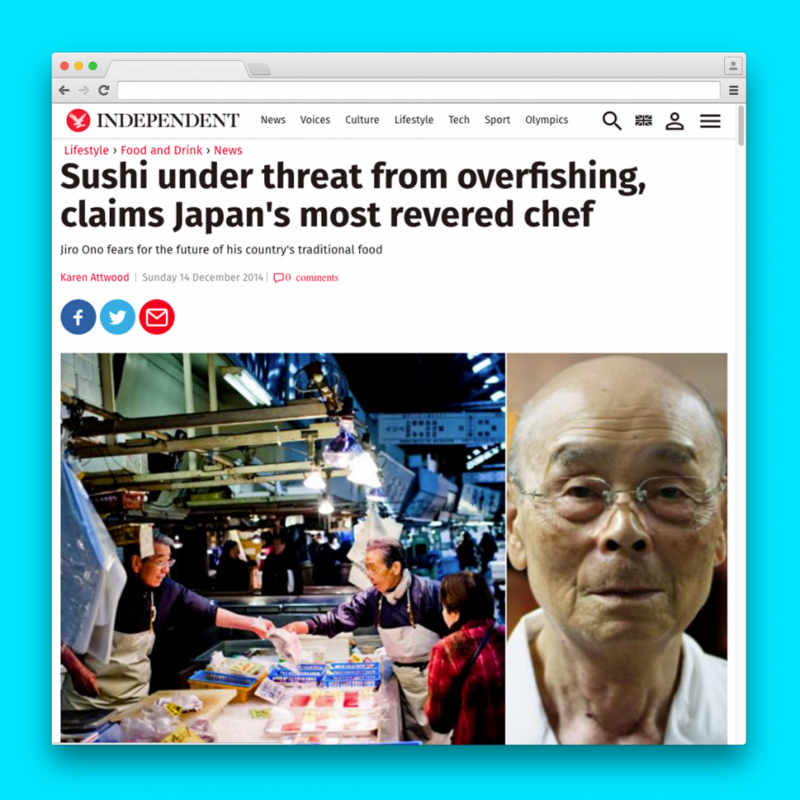 The world’s most renowned sushi chef, Jiro Ono, predicts a bleak future for the Japanese speciality because of increasing difficulties in sourcing ingredients, because of overfishing. Although long celebrated in Japan, Ono came to global attention when he became the subject of the US documentary Jiro Dreams of Sushi in 2011. He is uniquely qualified to know. He was apprenticed aged eight (“I was at elementary school but there was no time for homework. I have been used to standing all day since then”). Ono received Japan’s prestigious Medal with Yellow Ribbon for dedication to his profession last month. His restaurant Sukiyabashi Jiro was the first sushi restaurant in the world to obtain three Michelin stars, in 2007, when the Tokyo edition of the guide was launched. Unsurprisingly, he retained the honour this month when Tokyo kept its crown as the gourmet capital of the world with the most starred restaurants. This comes a year after Japanese food (washoku) became the second cuisine, with French, to make it on to Unesco’s cultural heritage list. Despite its status, Sukiyabashi Jiro is a modest restaurant in the basement of a business building at the entrance to Ginza Metro station. Customers have no choice over the 30,000 yen (£160) menu, and are served a set 20 pieces, which differ depending on the best ingredients sourced that morning at the famous Tsukiji fish market. When Barack Obama ate at the restaurant earlier his year, food critic Masuhiro Yamamoto said the occasion was the “first time in history that the President of the US has had something prepared for him and eaten it immediately after it was prepared”. Since the visit – during which Obama ate every piece of sushi, according to Ono’s son Yoshikazu, despite reports he ate only half – Ono’s customers are 70 per cent foreign guests. The restaurant, which only takes reservations one month ahead, always books out instantly. No one answers the phone, so it is almost impossible to call for a reservation. The best chance of getting a last-minute table is by going through the concierges of Tokyo’s top hotels, such as the Palace Hotel or the Ritz-Carlton.